Professional Photography? Is it the Career for You? Your neighbor picked up a new Canon Rebel for Christmas, and now, a few months later has a blog and Facebook page and is running Business Portraits “Get the DVD for $100” promo. What’s up with that? So how does one evolve into a professional photographer? Most photographers who have managed to survive for more than a few years, can look back and provide similar answers about what was important along the way. Every experience is different, and there are many ways to peel the apple, but most pros resonate the same general thoughts…especially the most successful ones. Early years are spent learning the craft of professional photography. Not booking photo shoots, designing logos and blogs, or setting up Facebook pages. Just learning. This might be formal degrees or classes, attendance at workshops, forum participation, receiving critique, studying style and methods and trends. For Brett Gilmour it started with the camera, then in a wet darkroom, extended to Photoshop, and then beyond. Most professional photographers also move from building skills to apprenticing and building a portfolio. Portfolio building is that in between space where you want to be in business, but you don’t have real experience shooting end-to-end photography projects for clients and you have not firmly established business processes and workflow. It can be tiresome to be in this space, but it’s invaluable and should serve as a checkpoint to figure out if you really want to be a professional photographer. Apprenticing is an invaluable part of a professional photographers career. It’s when a photographer learns how to approach a shoot and what the business of running a photography studio is all about. Apprenticing teaches photographers how to work on a team with clients, art directors, designers, stylists and account reps. It teaches one how to be a professional photographer by working under pressure and delivering good results on every shoot. Once you are in business, one of the best things you can do for yourself is to ensure that you have established your brand, that you are priced for profitability, and that you can deliver consistent images, shoot after shoot, that reflect the style shown in your portfolio. So while it seems like one should be able to pick up a camera, shoot great photos, and then go into the photography business, that’s not really the case. Shooting, exposure, composition, processing, and style. What is technically correct. What is artistic. What makes your heart happy. What rules you can break and what you must continuously improve on. Business and costs. Knowing how much time you spend on a shoot compared to how much you charge for it, while also taking your true Cost of Goods and Fixed Expenses into account. Whether you are charging $1650 or $3,200 or $4,295 for your photography, you HAVE TO UNDERSTAND what comprises your cost basis, and pay yourself for your time. Brand and style. This comes down to WHO YOU ARE. Everything you do has to line up with who you are. Before you dive deep into your photography business, you should have a sense of how you shoot, how that translates into an image, what story it tells… and then line up your processing to enhance that. Finding an identifiable style, and sticking with it, at least for your clients, is crucial because your clients will hire you for the consistent photography style they see on your site, blog and Facebook portfolios. Your niche (what you are willing to shoot, what you love to shoot and what you won’t shoot). Inevitably, someone is going to ask you to shoot them something that you don’t want to shoot. You need to know how to gracefully say no, or figure out how to meet what they want. Figure out what you love to photograph, and what photography make you happy. Your photography niche, like your brand, has to support who you are and what you do as a professional photographer. Your photography business is YOU. Every single decision and work you produce is a reflection of YOU. There is no corporation or bad boss to hide behind. There are rarely co-workers. If you produce a series of images that doesn’t make your client happy, that’s their opinion of your work (or you). If you are late on post-production, that’s a reflection on you. If you can’t deliver what they ask for (reasonable or not), it is that YOU can’t deliver. Understand how thick your skin must be to put yourself out there for EVERY SINGLE SHOOT and risk clients calling your most beautiful photography “not what they wanted.” That, will happen. If you can make it through ALL THAT, understand that you will experience the complete joy of delivering professional photography to people that they cannot achieve on their own. You will have the opportunity to stop time, and deliver images that reflect the story they want to tell, which can be invaluable. You will develop lifelong friends and clients. You will create a following of people that “get you” and your style and will come back for years. You will smile on your good days, cry on your bad, but everything you do is YOURS and you own that. 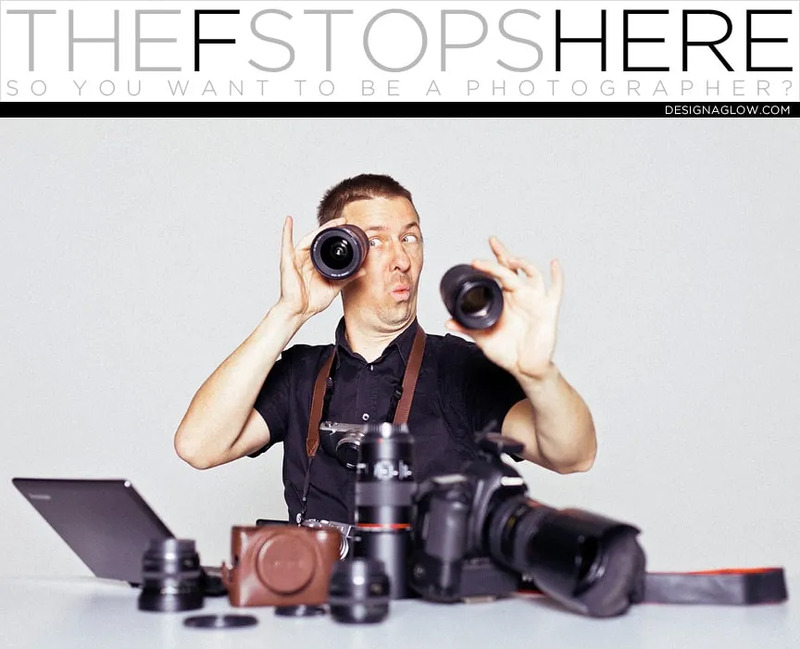 ~ Adapted from The F Stops Here, an exclusive collection of articles by Design Aglow.